When I go on vacation, I often have trouble finding something to eat at a restaurant. Something I thought I’d never get. Not a fan of the yellow mystery cheese. But these nachos had no cheese. Instead, it had a bit of some wasabi sauce mixed in. There was so much stuff in the nachos that I dug my way around the chips (my family ate those) and still had left overs! It was so good that I had to recreate it. Unfortunately, I do not have the money to grill me up some tuna steak, so I had to use canned tuna instead. Oh well, still tasted amazing. I also made eggplant chips instead of using tortilla chips. They came out of the oven nice and crispy, but when I mixed them in at the end, they kinda grew soft. Therefore, I advise just serving them on the side and using them as dippers if you want a “nacho” feel. Either way, it tastes amazing! Spray baking pans with cooking oil. Cut the eggplant into thin coins, as thin as you can make them. Quarter the coined slices. Lay the slices on paper towels and sprinkle with salt. Let sit for 20 minutes. Afterwards, blot up water that forms on top of the eggplant with another paper towel. Arrange slices on baking pans and spray with cooking oil of choice. Sprinkle with pepper and bake at 375 degrees for 25-35 minutes, removing individual eggplant chips if they become crisp earlier. Meanwhile, take several leaves of lettuce at a time, twist together, and cut into strips with kitchen shears. Spread out on serving platter. Top with chopped shallots and place in fridge. In a small bowl, mix together wasabi ingredients. Also place in fridge. 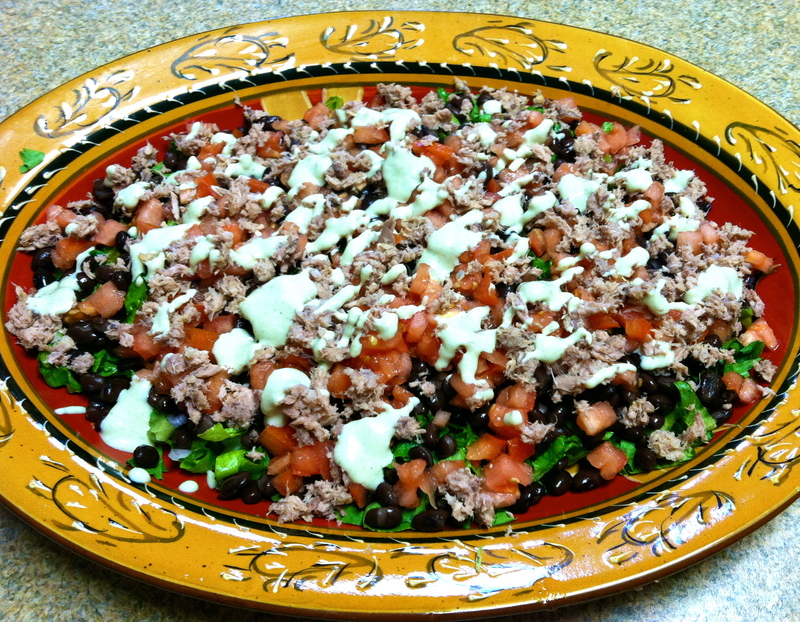 Right before serving, add black beans, tomatoes, pepper, tuna, and wasabi sauce. Toss together. 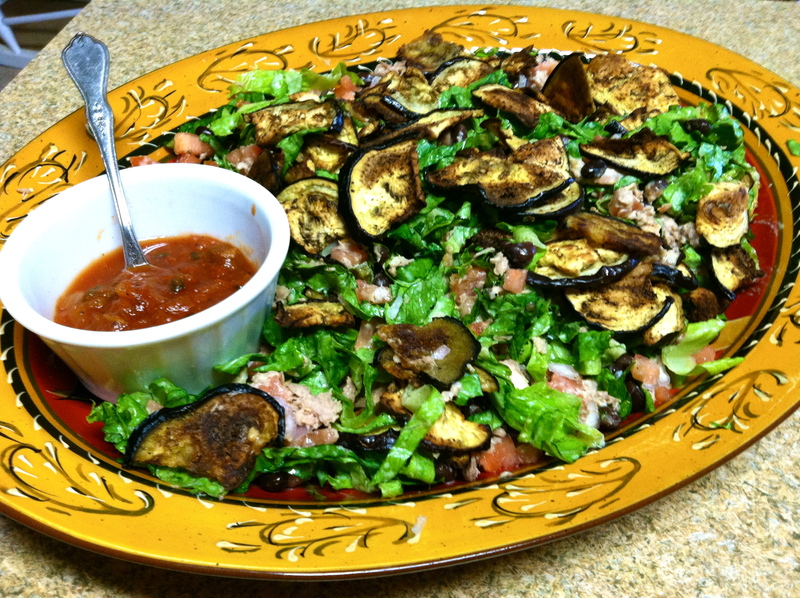 Add in eggplant chips and toss again (or just leave on the side to keep crisp). Mix in mashed avocado and/or salsa, if desired.